Recently, Altalink’s Heartland Transmission Project reached a successful completion, on time, under budget and with superior safety performance. 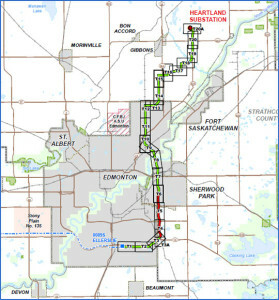 The project involved the construction of a high voltage line connecting the Heartland Region northeast of Edmonton to existing infrastructure in South Edmonton. But the project didn’t start out this way. Heartland kicked off with a series of incidents that led Altalink to reach out to us. We were able to send a trusted HSE Worksite Representative to diagnose the sources of Altalink’s concerns. Over a period of three months, Xi Safety was present on the project to collect baseline observational data of the underlying issues, and we worked with Management to craft a Corrective Action Road Map to get the project back on track. Altalink management was responsive to our feedback and implemented many of our recommendations. We want congratulate Altalink on the successful completion of this project, and thank the project management team for their proactive approach, foresight and demonstrated commitment to Safety. WHAT CAN WE BRING TO YOUR NEXT PROJECT? Xi Safety TM Inc was engaged by our client to undertake a eight week evaluation of the safety performances of all contractors and stakeholders on this project. We identified present challenges that were hurdles to successful safety opportunities and performance while developing a new model for implementing corrective actions. an analysis of the existing data, programs and processes being used. interview and conversations with Field Safety Teams, Supervisors, Senior Project Management and workforce. all incident reports were trended and risk ranked with those deemed High Potential were subjected to root cause analysis. observe the quality and content of contractor and project orientations and make recommendations for immediate and long term improvements. attend and monitor the content and quality of tail gate/safety meetings and make recommendations for improvements. review all hazard assessments that were made for the project and determine their relativity for work being performed and recommend adjustments. review project safety goals to determine if TRIR rate is practical and attainable based on present trends. thorough review of all contractor safe work procedures and to determine based on HSE administration as to whether they are being properly utilized and recommend required changes where needed. review and recommend an overall restructuring of the management of change process to include a better process of sign off and worker inclusion. examination of the effectiveness and commitment of the project leadership and their engagement in the Project Safety Execution. examination of the existing project and contractor safety cultures, making detailed recommendations for improvement. observations of attitudes and behaviors on site during work and planning sessions, including participation at all levels in the safety process. review and recommend improved content and clarity of work detail and instructions.